Henri Epstein was born in 1891 in Lódz, Poland. His father died when he was three and he was raised by his mother who encouraged his interest in painting. He studied at Jakub Kacenbogen's drawing school at Lódz, then the School of Fine Arts in Munich. Epstein visited Paris in 1912 before serving in the Polish army, then returned to Paris and settled at La Ruche from 1913-38, studying at the Académie de la Grande Chaumière. Although Epstein’s early art work was influenced by fauvism, he then adopted an expressionist technique. He exhibited both at the Salon d'automne and the Salon des Tuileries. He illustrated Gustave Coquiot’s Vagabondages (1921) and Pierre Bonardi's Les Rois du Maquis (1926), as well as contributing to the first Jewish artistic journal Machmadim. Epstein bought a farm near Epernon, which became his refuge during the Occupation, until on 23 February 1944 he was arrested by Gestapo agents. Despite appeals by his wife (the daughter of painter Georges Dorignac) and his friends, Epstein was sent to Drancy camp on 21 February 1944. He was deported on 7 March in convoy number 69 and killed in Auschwitz. A retrospective exhibition of his work was held in Paris in 1946. The title of the painting, Forest of Rambouillet, refers to a forest located west of Paris, near to where the artist used to live. 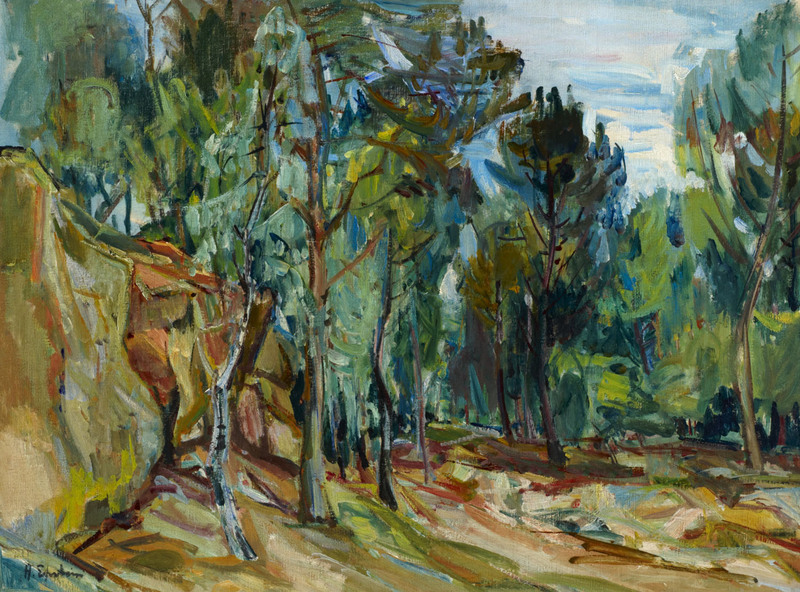 Epstein uses a predominantly green palette, free brushstrokes and generously applied paint to create a textured and vivid surface typical of his later expressive style.